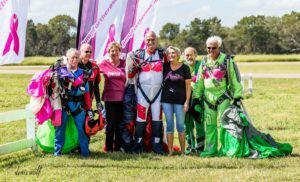 Come jump with us as we join Skydive Dallas for their American Revolution Boogie, starting on Thursday July 3. Jump For The Rose will be there for the weekend. Al Hively will be organizing some awesome jumps. One of the best things about Skydive Dallas is their hospitality, so plan to stay and enjoy the evenings activities! Buy a t shirt or make a donation to help us save women’s lives.